Corynebacterium pseudotuberculosis (Cp) is a gram-positive bacterium that is classified into equi and ovis serovars. The serovar ovis is the etiological agent of caseous lymphadenitis, a chronic infection affecting sheep and goats, causing economic losses due to carcass condemnation and decreased production of meat, wool, and milk. Current diagnosis or treatment protocols are not fully effective and, thus, require further research of Cp pathogenesis. Here, we mapped known protein-protein interactions (PPI) from various species to nine Cp strains to reconstruct parts of the potential Cp interactome and to identify potentially essential proteins serving as putative drug targets. On average, we predict 16,669 interactions for each of the nine strains (with 15,495 interactions shared among all strains). An in silico sanity check suggests that the potential networks were not formed by spurious interactions but have a strong biological bias. With the inferred Cp networks we identify 181 essential proteins, among which 41 are non-host homologous. The list of candidate interactions of the Cp strains lay the basis for developing novel hypotheses and designing according wet-lab studies. The non-host homologous essential proteins are attractive targets for therapeutic and diagnostic proposes. They allow for searching of small molecule inhibitors of binding interactions enabling modern drug discovery. Overall, the predicted Cp PPI networks form a valuable and versatile tool for researchers interested in Corynebacterium pseudotuberculosis. Corynebacterium pseudotuberculosis (Cp) belongs to the supra generic CMNR group (Corynebacterium, Mycobacterium, Nocardia, Rhodococcus) of bacteria . It is an intracellular Gram-positive pathogenic bacterium that is fimbriated, non-motile and non-capsulated  and is present in two serovars: ovis and equi . The serovar equi infects mainly horses and cattle while the serovar ovis is the etiological agent of caseous lymphadenitis (CLA), a chronic infectious disease affecting mainly sheep and goat populations. It can also infect humans upon occupational exposure [4, 5]. CLA is prevalent in several countries around the world [6–21] and causes significant economic losses due to low carcass quality, a decrease in the production of meat, wool and milk [22, 23], while also causing animal mortality due to suppurative meningoencephalitis . The available methods for CLA diagnosis or treatment are not effective enough and require further research to tackle the threats posed by C. pseudotuberculosis. Hence, it becomes important to know how the genes, transcripts, proteins and other molecules inside the bacterial cells interact with each other and with the outer environment to perform their biological functions [25–29]. From this perspective, the study of proteins and their interactions allows for a better understanding of the molecular mechanism of cells at a system level [30, 31]. The protein-protein interactions (PPI) form a complex network represented as a graph, where the nodes represent proteins and undirected edges connecting these nodes represent the interactions between the proteins [32, 33]. Generally, PPI networks have shown to be a great vehicle for developing new hypotheses and designing novel laboratory experiments [34, 35]. Furthermore, essential proteins can be identified by topological analysis. An essential protein is defined as a gene which demonstrates to be lethal for the organism when subject to a knock-out . Therefore, essential proteins are potential drug targets [37–41], enabling the development of new drugs against pathogenic microorganisms [42–45]. Generally, in silico reconstruction of biological networks is a long standing problem and is applied to various different types of networks. As prominent example may serve the reconstruction of the regulatory network of various different Corynebacteria which has become a widely used resource [46, 47]. In this manuscript, we predicted the potential PPI networks of nine strains of Cp serovar ovis using the interolog mapping method. The interolog mapping method was already successfully applied in several other studies, for example to predict the interactions in Mycobacterium tuberculosis , Leishmania spp. , mouse  and Bacillus licheniformis . While Yu et al. used an identity > 80 % in their “generalized interolog mapping” to transfer interactions, we have refined this cut-off in one of our previous studies by means of an exhaustive in silico evaluation . We used the experimentally validated and manual curated small-scale interactions from the DIP database (Database of Interacting Proteins)  as the gold standard and further collected the interactions from three different and independent PPI databases (STRING (search tool for recurring instances of neighbouring genes) , IntAct  and PSIbase (database of Protein Structural Interactome map) ) as the input for the network transfer and aimed to reconstruct the interactions in the DIP database. In this setting we archived a specificity of 0.95, sensitivity of 0.83 and a precision of 0.99 when we compared our predictions with the gold standard . In a different study, Yu et al. archived an accuracy of 54 % when employing a similar method for transferring the interactome from C. elegans to S. cerevisiae ; two evolutionarily rather different organisms. In this study, we are convinced that our predictions are more reliable as with C. glutamicum we have an exhaustively studied model organism at hand which is evolutionary very close to Cp [46, 47, 58]. Due to this exhaustive previous work, we only perform a brief in silico sanity check of the derived networks before identifying essential proteins which might be promising targets for further wet-lab experiments. It is important to note that the reported PPI networks are a mere list of potential interactions and should serve as a basis for further research. The experimental validation for the predicted potential interactome is out of the scope of this study. For all nine strains of Cp, we predicted a total of 150,019 potential protein-protein interactions involving 10,370 of the in total 18,890 proteins (Table 1). Proteome: total number of proteins; Interacting proteins: number of proteins participating in the interaction network. Interactions: number of predicted interactions used for network composition. 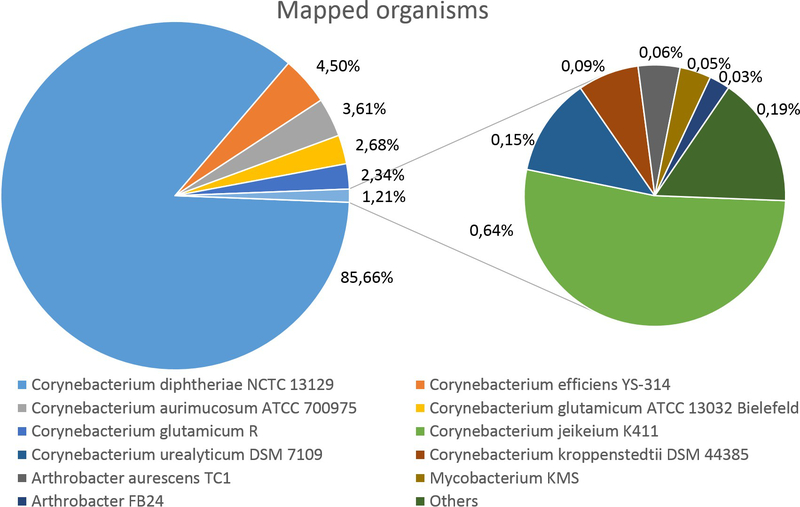 The analysis of the prediction origin shows that the vast majority of interactions were mapped from phylogenetically close organisms, belonging to the genus Corynebacterium (in ~99 % of the cases) but also reveals some predictions from more distant organisms (Additional file 1: Figure S1). As described above, in order to check the credibility of our network predictions, we performed statistical sanity checks on the network topology. We were able to show that the node degree distribution approximately follows a power-law distribution and in combination with shortest-path analysis, suggest that the predicted networks have a scale-free topology, both prevalent and relevant characteristics pertaining to biological networks. The clustering coefficient, correlation and regression analysis using the R-Squared values from predicted Cp interaction networks and the Shapiro-Wilk  normality test demonstrated that the degree distribution of predicted interaction networks do not follow a normal distribution (p-value < 2.2e-16) (Additional file 2). All analyses suggest that the networks were not formed by spurious interactions but originated due to a biological growth process. Moreover, the high Clustering Coefficient of the predicted networks suggest the existence of self-organization inside the biological cell motivated by the interactions . Furthermore, we were able to confirm the existence of several clusters of our networks by means of literature research, increasing the confidence in the methodology and the predictions (Additional file 3). Please note, that these test comprise mere sanity checks of the potential networks and should not be misinterpreted as exhaustive proof for correctness of the potential interactions. Not surprisingly, due to the extremely clonal life-style , almost all predicted interactions are found in all Cp ovis strains (i.e., core-interactome). Strain specific interactions or the accessory interactions are also of great interest as they might explain the biological specifics of a strain. However, here we focused on exploring the core-interactome of the nine Cp ovis strains aiming to better understand the serovar ovis in general and derive potential viable targets for further wet-lab research. Essential proteins are proteins which have a lethal effect when removed from the organism. It was shown that the node degree of a protein (i.e., the number of interactions of that protein) is correlated with the lethality [62, 63]. Thus, potential essential genes may be identified by identifying hub nodes in the network, i.e., nodes with a very high node degree (refer to the Methods section for details). In our predicted networks, we identified 181 hub proteins each having 68 or more interactions. In the set of hub proteins, we find proteins involved in biological processes related to carbon metabolism, cell envelope and cell wall, DNA metabolism, nucleotides biosynthesis, folding, translocation, ribosomal translation factors, tRNA synthetase, RNA metabolism and respiratory pathways, among others. Aiming to verify the essentiality of these Cp hubs, we searched for homologous proteins in the database of essential genes (DEG) [64, 65]. Among the 181 hub proteins, 180 had homologous counterparts already stored as essential in DEG, showing the effectiveness of our method for identifying the essential proteins (Additional file 4). The DNA repair protein (RecN), was the only essential protein not found in DEG, apparently being exclusive to Cp. RecN is responsible for maintaining DNA integrity when exposed to various stress conditions. Despite the conserved mechanism, both metabolic pathways and proteins can differ in each species . This indicates the essentiality of this protein and explains why there was no counterpart found in DEG. Even though the vast majority of proteins have homologs in DEG, this does not reduce the importance of reporting their essentiality. Considering Cp is not covered by DEG till today, the description of essentiality in this organism is novel for all 181 proteins. It is worth noting that while most essential proteins have homologs from over 20 organisms covered by DEG, three proteins have homologs in only a single organism, demonstrating either the lack of experiments which would support their essentiality, the lack of protein conservation across different species or that the essentiality of these proteins is not conserved across species . These proteins are: Catalase (KatA), Endonuclease III (Nth) and Trigger factor Tig (Tig). Catalase (KatA) is homologous to KatE from Salmonella enterica. KatA is an oxidoreductase enzyme which decomposes hydrogen peroxide (H2O2). It was already studied for instance in C. glutamicum [68, 69] and C. pseudotuberculosis . Endonuclease III (Nth) has a homologous counterpart in Haemophilus influenzae stored in DEG. Nth is a base excision repair enzyme  that participates in a pathway preventing the loss of DNA functionality e.g., by spontaneous mutagenic lesion  or near-UV radiations . This mechanism is well studied and is conserved in the Corynebacterium species . Trigger factor Tig (Tig) has a DEG homology against Pseudomonas aeruginosa and participates in the protein folding process. Additionally, in order to propose potential biomarkers or therapeutic targets among the essential proteins, a search for homologs in the host organisms O. aries, C. hircus, B. taurus, E. caballus and H. sapiens was performed. 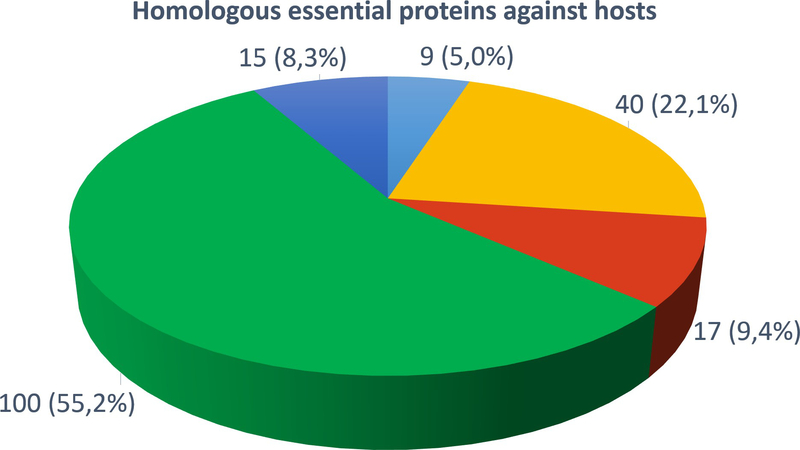 We identified 41 non-host homologous proteins, i.e., these are essential proteins of Cp which have no homologs in one or more host organisms. Among these non-host homologous proteins, 15 are with no alignment hits against any of the five hosts, nine with no alignment hits against O. aries and C. hircus and the remaining 17 had only low identity and low coverage hits (Additional file 5: Figure S2). The 24 non-host homologous proteins without any significant hit against at least one host are: chorismate synthase (aroC), dihydrodipicolinate reductase (dapB), DNA primase (dnaG), elongation factor P (efp), cell division protein (ftsZ), ATP phosphoribosyl transferase (hisG), dihydroxy-acid dehydratase (ilvD), aspartate kinase (lysC), UDP-N-acetylglucosamine (murA), transcription anti-termination protein (nusG), uridylate kinase (pyrH), DNA repair protein (recN), transcription termination factor (rho), 50S ribosomal protein L1 (rplA), 50S ribosomal protein L10 (rplJ), 50S ribosomal protein L31 (rpmE), DNA-directed RNA polymerase subunit alpha (rpoA), 30S ribosomal protein S3 (rpsC), 30S ribosomal protein S6 (rpsF), 30S ribosomal protein S13 (rpsM), holliday junction DNA helicase subunit (ruvA), SsrA-binding protein/SmpB superfamily (smpB), indole-3-glycerol phosphate synthase (trpC2) and anthranilate synthase (trpE). As these proteins are essential to Cp but do not occur in the host organisms, they naturally are a potential drug-targets because inhibiting these proteins is likely to be lethal for Cp whereas the host proteome remains unaffected due to the missing homologs and furthermore due to the greater potential of these proteins to participate in inter-species interactions with the host . A small subset of the essential non-host homologous proteins participates in the same metabolic pathway and thus is of particular interest. These proteins are the Indole-3-glycerol phosphate synthase (trpC2), Anthranilate phosphoribosyl transferase (trpD), Anthranilate synthase (trpE) and Anthranilate synthase component II (trpG); all are involved in the metabolic pathway of tryptophan biosynthesis, which produces amino acids of biotechnological interest and are essential in human and animal nutrition . This metabolic pathway involves proteins encoded by the genes of the Cp operon trpABCDGEF which was already studied and characterized in other organisms . Prephenate dehydratase (pheA) is involved in the metabolic pathway of phenylalanine biosynthesis from the chorismate pathway . Tryptophan, phenylalanine and tyrosine are aromatic amino acids and share the beginning of a pathway found and characterized in C. glutamicum  whose proteins are also partially present in the Cp biovar ovis. Additionally, the other essential proteins interacting in this network are Tryptophanyl-tRNA synthetase (trpS), Phenylalanyl-tRNA synthetase subunit alpha (pheS) and Tyrosyl-tRNA synthetase (tyrS). Furthermore, the cluster analysis draws attention to the Cp iron acquisition system, which is well characterized and contributes to the survival and virulence of microorganisms [80, 81]. The cluster consists of proteins associated with different iron acquisition systems, a strategy to acquire iron from multiple sources in low availability , suggesting both, alternative metabolic pathways and alternative proteins from different operons exerting the same function. In the potential Cp networks, these multiple systems interact with each other and consist mainly of proteins from the operons fag, ciu, fec and hmu, suggesting a potential ability to import iron from the host [83, 84] (Additional file 3). For the first time, we reported potential PPI networks for nine Cp ovis strains based on an in silico prediction. The employed methodology is well-established and we consider this work as the starting-point for the development novel hypothesis and the design of upcoming wet-lab studies. Nevertheless, it is important to notice that the in silico predictions only represent a candidate list of potential interactions and may contain false-positives, in particular when considering that the original interactions utilized for the prediction also contain false-positives themselves. The main contribution and analysis of this work is the identification of potentially essential genes which have a very high node-degree in the network reducing the impact of sporadic false-positives. In total, we identified 181 essential proteins, 41 of them being non-host homologous, hence becoming good candidates for drug development or CLA diagnosis. Since the essential proteins interact with many others, it is natural to assume they are associated with various biological processes, in their own species as well as in the host, and hence are attractive targets for therapeutic and diagnostic proposes . Especially each predicted interaction of an essential protein is a potential candidate for the identification of inhibitors [86, 87] and thus opening several drug development opportunities targeting C. pseudotuberculosis. Especially the non-host homologous essential proteins might serve as potential targets for inhibiting interaction class drugs [40, 86, 88]. Generally, all reported potential interactions might allow for searching small molecule inhibitors of binding interactions [45, 86, 89], making modern drug discovery research possible . By knowing the interaction partners of a protein, it is hence possible to provide a systemic view of the organism . To sum up, the PPI networks reported here are valuable tools for researchers to identify proteins or interactions as potential drug targets. We have employed the workflow depicted in Fig. 1 for deriving the candidate list of potential protein-protein interactions. We will give a brief summary of the method before describing the details in the subsequent chapters: We have extracted known regulations of publicly available databases and used those as the basis for our predictions (see subchapter data sources). For each interaction we have searched for conserved counterparts in the Cp strains. In case both interaction partners were sufficiently conserved (refer to the subchapter interolog mapping) we assumed the interaction to be a candidate for a potential interaction in the corresponding Cp strain. The networks derived with this method then were briefly checked for sanity in silico. We continued the analysis by using only potential interactions predicted for all nine Cp strains, i.e., the core-interactome. Here, we extracted the 15 % top ranking nodes with respect to the node degree in the networks which represent potentially essential proteins. In fact, we found for all extracted proteins but one an entry of a homologous protein in the DEG database. Further, we compared the potentially essential proteins against the proteome of the host organisms in order to discover essential proteins exclusive to Cp which comprise potential drug targets. Overview of the workflow utilized in this manuscript. a We extracted known interactions from the STRING, DIP, and IntAct databases. b For each interaction we searched for conserved counterparts in the nine Cp strains and mapped the interaction in case an ICS score of 0.5625 or larger was achieved (c). The mapped interactions form the candidate networks for the Cp strains (d). For the further investigation we only used those interactions which are present in all nine strains (e) and extracted the top 15 % proteins with the highest interaction degree (f) as they are most likely to be essential proteins. Of the selected 181 proteins were 180 indeed present in the DEG database and furthermore, 41 of those have no homologous counterpart in the host organisms and thus are promising potential drug targets. The prediction of the PPI networks is based on the protein sequence similarity and the information of already known PPIs. The protein sequences were downloaded from NCBI and the known PPIs were retrieved from three publicly available databases (Table 2). The STRING database  is composed of known and predicted PPIs, including direct (physical) and indirect (functional) associations derived mainly from genomic context, high-throughput experiments, co-expression and computational prediction methods. The DIP database  contains experimentally determined PPIs that are automatically or manually curated. The IntAct  database consists of molecular interaction data derived from literature or direct submissions. The DIP and IntAct databases are curated by the IMEx (International Molecular Exchange) consortium . It is important to note that all databases may contain false-positives, i.e., report an interaction when in fact there is none. This might in particular be true for the largest of the databases, the STRING database. There have been several attempts to filter out false-positives from such databases, e.g., by means of integrating several scores with Bayesian methods  or by incorporating inter-species confirmation (i.e., regulations which have been experimentally confirmed in different species) . In this work, the main focus is on the identification of essential proteins (i.e., proteins with a high node degree in the network) thus impact of a limited number of false-positives is reduced. We only employ interactions from the STRING database with a score of above 0.700 (i.e., high-confidence interactions) . Only approximately 10 % of the interactions (around 29 million) are classified in the high or highest confidence categories. STRING database contains in total of 673,123,356 interactions including duplicate interactions (downloaded in 2014, June). DIP, STRING and IntAct are publicly available and free to use. In order to transfer the known interactions to the Cp strains, we employed the so-called interolog mapping which was already successfully utilized in several other studies [48–50] and essentially corresponds to the “generalized interolog mapping” method as described in Yu et al. .
We considered interactions with an ICS(AB) greater than 0.5625 (corresponds to at least 75 % identity and 75 % coverage on average) as conserved. This threshold was derived in a previous study  as described in the Background section. When redundant interactions were found (e.g., through a homologous interaction pair of a different organism), the one with highest ICS(AB) was used to compose the PPI network. As a first sanity check of our potential PPI network, we aimed to show that the predicted networks show realistic and typical network properties. Therefore, we computed several network statistics and compared them to those of known biological networks. We utilized the Cytoscape  plugin NetworkAnalyzer  and calculated the shortest path [33, 62, 100], the degree distribution , the network topology and the Shapiro-Wilk normality test . Furthermore, we investigated the inherent network structure by performing a cluster analysis. We employed Markov Clustering (MCL)  implemented in the Cytoscape plug-in ClusterMaker . We used an inflation parameter of 3.0 for the clustering. To reinforce that these interactions do occur in Cp, a literature search was performed to verify the existence of these clusters in phylogenetically close organisms (Additional file 3). In Saccharomyces cerevisiae it was shown that the node degree of a protein (i.e., the number of interactions of that protein) is correlated with the lethality of removing that protein from the network [62, 63]. Nodes with a high node degree are called hubs, but a clear definition of what node degree should be regarded as “high” is missing . Nevertheless, identifying nodes with a larger degree is a means for identifying essential proteins [104–106], since the knockout of hub proteins most likely cause a substantial disruption in the interaction network . We decided to classify proteins as essential when they are among the top 15 % proteins with respect to the node degree, a threshold commonly used . Next, to validate essential hub proteins, we searched for homologous sequences stored in DEG [64, 65] (v11.2, updated on July 3, 2015), a database of bacterial essential genes. For the homology detection we again employed BLAST with the following parameters: e-value = 1e−5, low complexity filter = false and matrix = BLOSUM62. We also aligned the essential proteins of Cp against the all proteins of the five host organisms Ovis aries (taxid: 9940), Capra hircus (taxid: 9925), Bos Taurus (taxid: 9913), Equus caballus (taixd: 9796), and Homo sapiens (taxid: 9606). We acknowledge the support of the National Center for High Performance Computing (CENAPAD-MG). This work was supported by Coordenação de Aperfeiçoamento de Pessoal de Ensino Superior (CAPES) and Conselho Nacional de Pesquisa (CNPq): The authors AS, RSF, WMS, PVSDC, and ELF receive support from CAPES; the authors VA, RSF, and ELF freceive support from the CNPq program. All necessary information is contained in the manuscript and the Supporting Material. Conceived and designed the experiments: ELF. Designed and modeled the database in Postgres DBMS: ELF. Developed routines in PL/PgSQL: ELF. Performed the experiments: ELF. Analyzed the data: ELF. Structured the paper: ELF, MG, RR, DB. Wrote the paper: ELF. Performed the clusters description: PVSDC, WMS. Performed the essential protein description ELF. Participated in revising the draft: ALL. Contributed materials/analysis tools/structure: JB, MG, RR, RSF, AS, DB and VA. All authors read and approved the final manuscript. Caufield JH, Abreu M, Wimble C, Uetz P. Protein complexes in bacteria. PLoS Comput Biol. 2015;11(2):1-23. doi:10.1371/journal.pcbi.1004107. Zhou H, Gao S, Nguyen NN, Fan M, Jin J, Liu B, Zhao L, Xiong G, Tan M, Li S, Wong L. Stringent homology-based prediction of H. sapiens-M. tuberculosis H37Rv protein-protein interactions. Biol Direct. 2014;9(1):5. http://dx.doi.org/10.1186/1745-6150-9-5.